The Italo-American driving for Prema Powerteam wins his third race 1 out of the three available. Behind him the French Brandon Maisano and Riccardo Agostini on the JD Motorsport's Mygale. 09/06/2012 - Eddie Cheever wrote again his name on the first race of the weekend after winning race one in Valencia and Hungaroring. The Roman driver of Prema Powerteam, started from the pole position has been attacked by his team mate Brandon Maisano who was first at the San Donato, the first corner of the circuit of Mugello, but could not keep the lead and had to give it away to Cheever. The French driver of the Ferrari Driver Academy put the hammer down and set a series of fast laps but did not manage to attack successfully his team mate and therefore at the chequered flag Cheever was first. Behind the couple of Prema Powerteam ended Riccardo Agostini (JD Motorsport) who was author of a solid race without being challenged by any other driver. Fourth was Henrique Martins, after a jump start that forced all Formula 3 drivers to run a second formation lap. 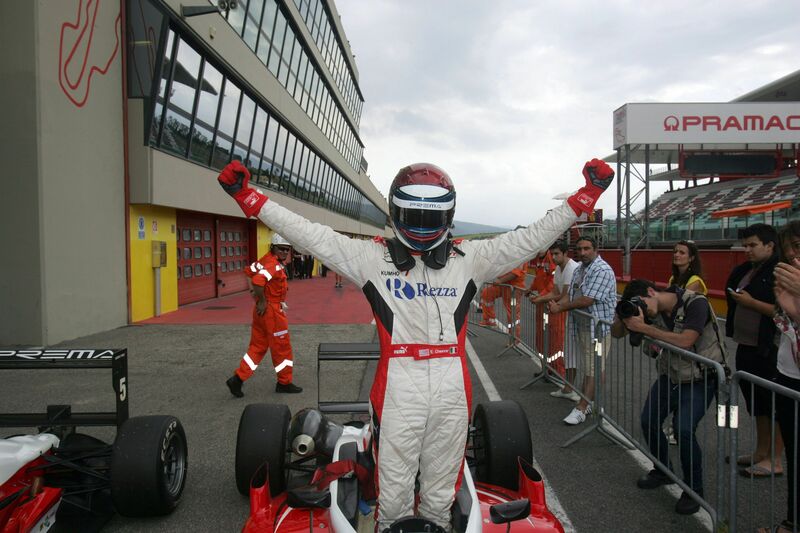 Fifth was the Russian of Euronova Sergey Sirotkin who was followed by Mario Marasca (BVM) and Robert Visoiu (Ghinzani). All the drivers from fourth to seventh ended within 4 seconds, with the Canadian Nicolas Latifi, from Mugello on the Mygale belonging to JD Motorsport just a few seconds adrift in eighth position. The last two drivers into points in the first race of the Mugello were Maxime Jousse (BVM) and Roman De Beer on the Mygale of Victoria World, third of the trans-alpine car competing against the nine Dallaras. Eleventh at the finish line was Yoshitaka Kuroda (Euronova), while Gerard Barrabeig of team Ghinzani stopped during lap four due to technical problems. The European classification sees Eddie Cheever in front of everyone with 93 points, 24 more than Riccardo Agostini who is one clear of Henrique Martins. The first points of the Italian Championship awarded Eddie Cheever ahead of Maisano, with the latter author of the fastest lap of the race and Riccardo Agostini. Eddie Cheever will start on pole of the second race of the weekend, the longest to be run on 30' plus a lap, with Maisano at his side. Live coverage on Rai Sport 2 tomorrow starting from 10.10 (GMT+2) and web streaming on www.acisportitalia.it. The sprint race on 15' plus a lap will see Mario Marasca on pole with BVM's Dallara who will be sided by Sergey Sirotkin (Euronova). The race will have live streaming at 18.50 on www.acisportitalia.it, while Rai Sport 2 will broadcast it recorded at 00.00.